For all of my Jewish readers; myself included; this evening marks the beginning of our holiest day in the year, Yom Kippur, or the Day of Atonement. On this day, many Jews the world over, will be fasting until sundown tomorrow in an effort to cleanse ourselves of any sins we have committed in the past year. That’s the part where we apologize to God for any offenses we may have committed against Him. But Yom Kippur is also about making amends with the individuals you may have offended, and this must be done directly, not through God. Traditionally, after you have asked forgiveness of the offended party 3 times, you are released from your obligation, and the sin of “unforgiveness” then falls upon the one who was originally aggrieved; as they would seem to lack the ability to forgive. It is a most interesting concept, and not as easily accomplished as one would think. The perception of just who was responsible for the affront is subjective at best, making this one of the most difficult of the Commandments to fulfill, as it involves pride. 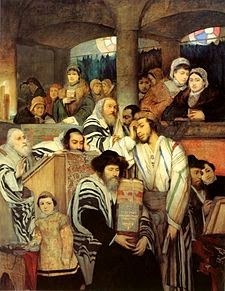 The painting above is called “Jews Praying in the Synagogue on Yom Kippur” and was painted in 1878 by artist Maurycy Gottlieb. To all my readers, regardless of faith, may we come together in the year ahead. The alternative to not doing so is almost unthinkable.